As Tim Buton filmed this movie, it has his quirky “dark” signature to it, but this movie has been toned down from its original, which Disney rejected as being too “dark”. This is my first stop-motion movie in black and white, which meant that not all of the character movements and scene transition were that smooth; giving that retro old-school projector ‘feel’. The monochrome-ness of the movies does not distract from the storyline and was pretty entertaining. 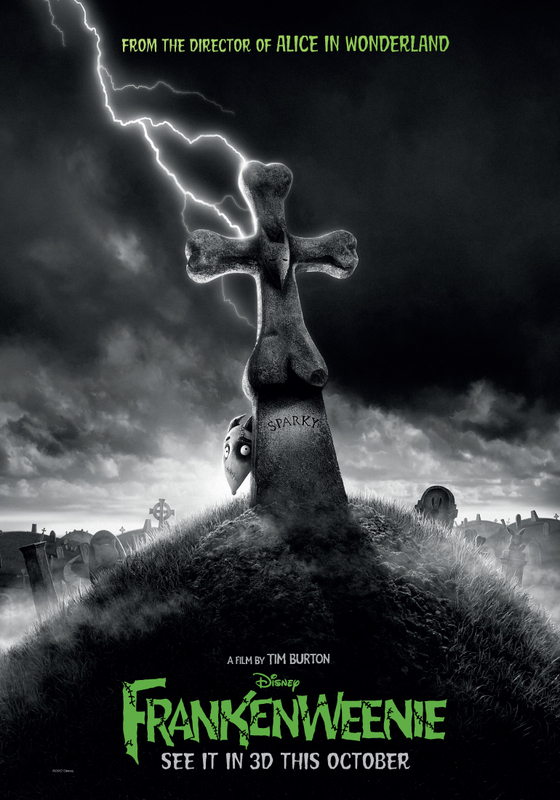 Although in black and white, it is not that gothic and it was amusing to see how the jokes in the movie were referenced to old black and white horror movies. The movie setting is in an American suburban area in the early 1950-60s where life in a relatively quiet small town called Holland about a boy called Victor Frankenstein. Victor is a very quiet boy who hard has any friends. His only friend is his dog, Sparky. Being quiet and spending all his time indoors with Sparky making home movies have made his parent worry about his development. His father manages to convenience him to participate in some outdoor sports, which ultimately leads to Sparky’s untimely departure. The moment when Sparky departs was very sad and emotional for a black and white movie. It just so happens that prior to the Sparky’s accident, Victor has a new science teacher who taught about the power of lightning and how it could move the muscles of the dead (the teacher used a dead frog). So in his sorrow and desperation, Victor sneaks into the pet cemetery and digs up Sparky’s body. Back home, he stitches and sews Sparky and wires him up to the electric current from the thunderstorm (through a very complicated process) and Sparky is revived! The awakened Sparky is the same energetic, happy dog, unaware that he was brought back from the dead. He is somewhat like an electrical device, which needs to get powered up with electricity – cute in a morbid way considering that he is already dead. As Victor tries to keep Sparky a secret, his classmate (who really resembles Egor) finds out his secret and blackmails him to tell him the secret of being back the dead to life. This is where things start to go awry as there is a school science fair that is ongoing and Victor’s other classmates find out his secret and want to outdo his creation. But they end up with monster creations that are wrecking havoc on the town. Meanwhile Sparky realizes that he is not the same dog he used to be: an encounter with Victor’s parents caused him to see himself in the mirror and you could see that look of horror flash across the dog’s face when he saw his reflection in the mirror. It made me feel bad for Sparky; he did not ask to be revived and now that he was, he was a monster, just a shadow of his former self. Sadly, the movie does not explore this aspect – about Sparky’s reluctance in this whole thing. Instead, the movie quickly shifts to saving the town from the monstrous creations that Victor’s classmates have brought back from the dead. In the process of trying to right the wrong of his (mad scientist) classmates, Victor’s life is endangered and Sparky comes to his rescue and dies a second time (emotional). However, as this is a Disney production it is a happy ending. I can’t say that it was a really satisfying ending, but at least there was closure for the characters and it was happy (in a creepy but kid-friendly way). This movie is perfect for those who love Tim Buton’s style and works, or just a fun filled movie that is slightly ‘dark’ but otherwise entertaining with a simple yet heart-rending storyline. The characters in the movie are enduring and hilarious, particularly Victor’s classmate when they were doing their science experiments and the cat “Mr. Whiskers”.